* I plan a rough menu for the week so I know what to buy when I go grocery shopping. * I plan out clothes shopping for when I have coupons or sales so I save money. * I know my daily itineraries -- and when I'll have late nights or early mornings -- so I can plan when to go to the gym. * I am able to fit in multiple activities a week -- volunteering, singing lessons, kickball, blogging, editing oddjobs, various trips/events -- so I can lead a holistic, balanced, productive life. Ah, but "balanced" is the key word here. That's where the wisdom part is often lacking. Because amid all the scheduling and calendar-ing and planning, I usually forget to leave time for the unexpected -- the nights left open to chance. You'd think that I'd learn my lesson. But no. I plan until the plans take over, and it's not about being present in what you made time for, but more about the act of making the time at all. And when that happens (at least once a quarter), I question why I do anything, and maybe life would be better if I gave away all my belongings and moved to a deserted tropical island with only a journal and a towel. Recently I asked another friend in semi-seriousness, “How do you know when you are doing too much?” He responded, “When it gets in the way of your life.” The things in the paragraph above are my life, very purposely and passionately so, but I think he meant that it is too much when your activities begin to define you and control you. Therefore, how do I gain that sense of freedom I had yesterday which paralleled the freedom I felt in jumping on a plane to Peru a week after buying a ticket or during my job search (more on this later as to why I was the happiest I have been in a long time while unemployed…)? Do I plan less? Care about fewer people? Leave more open space in my schedule? Draw more boundaries? Or less? Or do I just keep moving forward surrounding myself with people who nudge me when I have become too confined by my schedule to throw it all away for a day and just have an afternoon of spontaneity? She makes me wonder if the time-saving answer is to care more about the people who help you care less about the appropriate things. To reorder my sense of obligation, so that I'm nurturing those people and pursuits that feed me -- and cutting back on commitments borne of others' expectations. To understand/accept I am a compulsive planner, and work around it in the best way I know how -- by leaving time free in my calendar, designated as "for god's sakes Julia, just BE" time. And if all else fails ... to tell my friends to start shaking me and hold periodic calendar bonfires at undetermined times. Anybody else reading this and thinking, "Dear lord, this is me?" Anybody thinking, "This will never be me in a million years?" I want to hear from both camps. 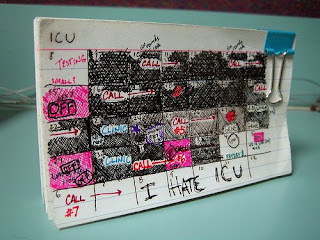 How do you keep your calendar as a record of your life, and prevent it from becoming your life? dear lord (and julia), this is me! While I agree you don't want to schedule your life away, I just want to emphasize that being organized is never a bad thing. It actually gives you freedom to do other things---even spontaneous ones, as contradictory as that may sound. Anyone who has goals needs to plan, but as you point out, balance is key. Be proud of yourself for being organized, and even prouder for recognizing when you need to make some adjustments. That will go a long way to creating a happy life. "To reorder my sense of obligation, so that I'm nurturing those people and pursuits that feed me -- and cutting back on commitments borne of others' expectations." I'm not question the fact that you enjoy all of the things you do, but you really have to ask yourself "is this thing something I absolutely love and can't live without? Does it help build and nurture and grow me as a person? Are there other things I'm NOT doing because I'm so over-scheduled that I can't even make time for?" And behind all of that "Does this make me happy?" If it doesn't make you happy, or doesn't make you AS happy as other things you do, stop doing it. Period. No explanation or apology needed. What are you saying 'yes' to when you say 'no' to something else?